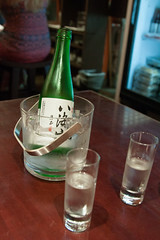 Disclaimer: Tim, who gave me the recommendation, is married to the cousin of the sushi chef at Sushi ii, Garrett Wong. But seeing that more than one member of Garrett’s extended family was dining there that night, I’ll still take that as a hearty endorsement. Walking in, it was immediately obvious that we should have had reservations (although if you had seen the generally random nature of our visit, we were mostly “winging it” the entire trip instead of planning things). But as luck had it, they had an open table if we were only going to be there for less than an hour and a half, so we ordered some sake and sat down. I’ll admit that I’m still a bit under-educated when it comes to really good sushi. I did most of my growing up before the great sushi craze hit, and most of my time has been spent living in places with few sushi restaurants. But I’ve learned over the years that there are some really great sushi chefs out there, serving up both traditional and non-traditional sushi. As I long ago learned at places like Sushi Ran and Oga’s, if you have the option for omakase, it’s generally a good idea to order it. You’ll get the best of the chef’s abilities, using the freshest product, and generally will have some much more interesting food than you’d get from the regular menu. 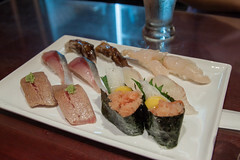 So that’s what we ordered: three rounds of the chef’s omakase, and I’m really glad we did. Since it was a whole month ago that I ate there, I’m looking at my photos and having a lot of difficulty recalling exactly what everything we ate was, but overall, this was one of the most enjoyable evenings of sushi I’ve had in a long time. 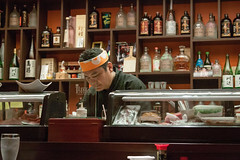 The chefs at sushi ii are really talented: everything that was served up was nigiri style, but were immaculately fresh, and excellently prepared. From my poorly scribbled notes, we had two types of toro (raw and seared), aka yagara (cornet fish, which was flavorful but not my textural favorite), torigai (medium-sized cockles), tsubugai (whelk), aka-ebi (raw red shrimp, which was wonderful), New Caledonian prawn (probably the one thing that evening I didn’t care for), shime saba (pickled mackerel), mentaiko (roe, I think from pollack), kurage (jellyfish), tai (red snapper, another favorite), aji (more mackerel), akamutsu (bluefish), and several other items that I can’t actually remember (I sadly should have remembered to grab the full itemized receipt, since it did have most everything identified on it). I apologize if I’ve butchered the names of anything. But this was definitely first class sushi: everything perfectly prepared, served up with real wasabi, and nicely presented and served as some nice groupings of sushi. The only sad part? I saw a lot of really great food coming off the sushi bar and out of the kitchen that was right off the menu, and the sashimi looked really good as well. I can easily see coming back here to try some of their regular menu as well. 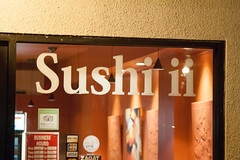 While it was somewhat pricey (well, good sushi usually is), the quality was phenomenal, and we left well pleased.